Top row, left to right: two Magtech .38 Special 158 grain LSWC; two DoubleTap .38 Special +P 158 grain hardcast LSWC; two Federal .357 Magnum 158 grain JSP. 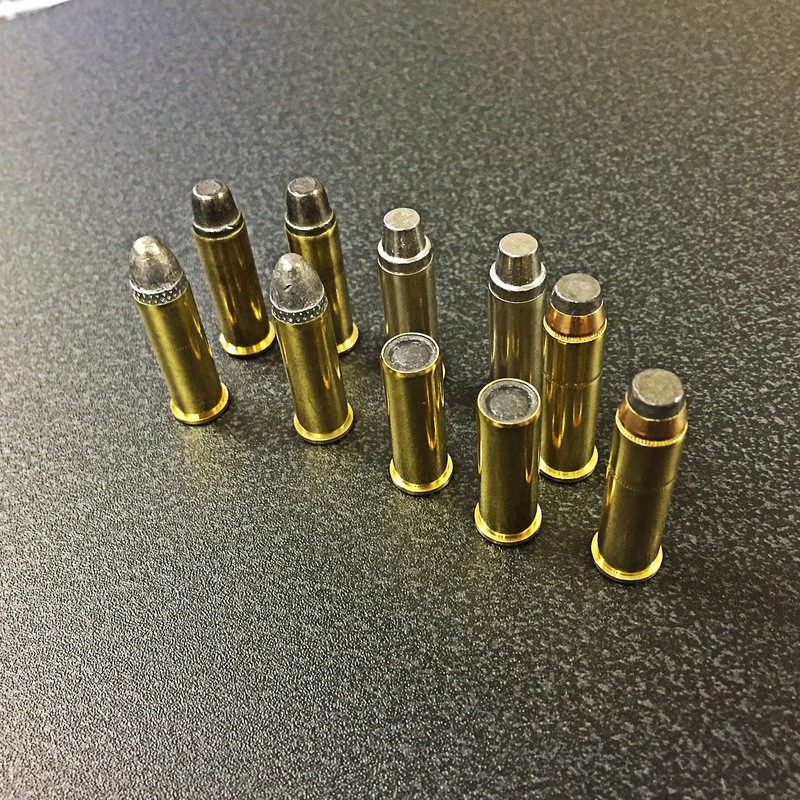 Bottom row, left to right: two Federal .38 Special 158 grain LRN, two Federal Gold Medal 148 grain full WC. All of these rounds could be fired from one gun; while revolvers may be old, their ability to perform many roles from self defense, hunting, and target shooting, is hard to match in a semi-auto pistol. If you were to try and match that versatility from a semi-auto pistol, what pistol would you choose? As an ORC (Old Revolver Cop), I can remember when we shot our quarterly quals with wadcutters because they were cheaper and easier on the guns. We only used street rounds (first RNLs, later JHPs) on the timed reloads,since it’s almost impossible to stuff in wadcutters with any speed. It wasn’t till the mid-’80s that we qualified with street loads (110-grain +P+, called Q-loads or Treasury loads back then). Even though I carry an auto now, I still have the same attachment to Smiths and Rugers that some people have to 1911s. If I could only have two guns, one would be a .357 revolver, and the other a 12ga shotgun, preferably with a spare rifled slug barrel. That covers most of anyone’s needs. A .357/.38 revolver is my favorite. I love my semi-autos, but if don’t have a full sized double action revolver in your collection you are really missing out on some great shooting. The wide range of ammo and the variability you have with reloading is incredible. From .38s that feel like .22s to .357 loads that will make your jaw drop and then you’ll chuckle.